Here, with His final actions before Good Friday, Jesus shows the disciples that they are to humbly serve one another. He reinforces this with His final discourse, “A new commandment I give to you, that you love one another; even as I have loved you, that you also love one another.” (Jn. 13:34) On Holy Thursday, the beginning of the paschal Triduum, Jesus commissions all of His disciples, that is, all Christians, above all else, to love one another. As with all things, Jesus’ words and example is the model for us to follow. Jesus Himself said He “came not to be served but to serve.” (Mt. 20:28) St. Paul too speaks of Jesus’ humility as He “emptied himself, taking the form of a servant.” (Phil. 2:7) He spoke often about the need for humility and service, and the necessity to live one’s life with Christian charity. One of Jesus’ great teachings is the parable of the Good Samaritan. He uses the parable to demonstrate what our mercy should resemble, and that we should “Go and do likewise.” (Lk. 10:37) In another parable, the Rich Man and Lazarus, Jesus warns us about the implications of not living a life of mercy and charity. In the parable, the rich man, who did not show mercy or compassion towards the poor man Lazarus, ends up in torment in Hades. Abraham reminds him that he had his opportunity to demonstrate mercy during his lifetime, but chose not to. These are sobering words from Jesus. Jesus’ new commandment is clear; we are to love one another. How then do we do this on a practical level? The varied number of ways we can fulfill this are as long as they are deep. We can do it in our everyday life and work. We can donate our time and money, or goods and services. We can volunteer at a soup kitchen, or be involved in a parish social ministry. One of the areas I find rewarding is working with the homeless population. Regardless of what the social and economic causes may be for homelessness, and whether our actions may be enabling them to some extent, Jesus did command us “Give to every one who begs from you.” (Lk. 6:30) To enter into the world of the homeless is to be barraged by sights, sounds, smells and struggles. It is to witness firsthand the brokenness in humanity in drug addiction and mental health sickness, and at times, crime. On the other hand, they are people just like you and me. Each homeless man or woman is a person, with an inherent dignity, made in the image of God. In their faces and bodies is Jesus. Although sometimes it is a difficult experience, I almost always feel enriched and spiritually renewed in serving them. And so, it is up to us to live out Christ’s commission of mercy and charity towards our neighbor: to love one another in humble service as He has loved us. This is Christ’s radical idea that upended the trajectory of the ancient world. 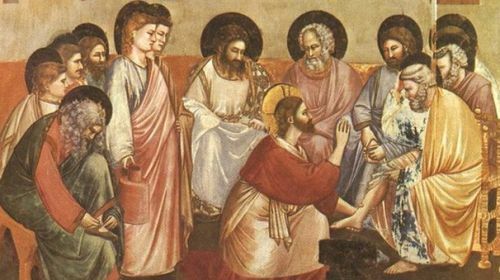 The God-man took the form of a servant and washed the feet of His disciples. This is Jesus’ radical example for us. It was in this Passover setting that the sacrificial lamb gave way to the sacrifice of Christ: the prefigurement gave way to the reality. Christ gave us this sublime example and new commandment at the Last Supper, as He offered the sacrament of His love in the Eucharist. We too can offer ourselves, as a living sacrifice, in our mercy and charity towards others, in union with the sacrifice of Christ. This entry was posted in Holy Thursday and tagged charity, Easter, Eucharist, Holy Orders, Holy Thursday, humble, humility, Last Supper, love one another, Mandatum, mercy, New Commandment, passover, service, Triduum, Washing of the feet on April 14, 2017 by Brian. Sacraments are rituals instituted by Christ, woven together with signs and symbols, (CCC 1145) that “make present efficaciously the grace that they signify.” (CCC 1084) St. Augustine described them as “an outward and visible sign of an inward and invisible grace.” They are not just symbolic, but are “real symbols,” which actually make present that which they signify. Sign and reality are one. Initiation into the sacraments initiates us into the mystery, or mystagogy, of Christ. (CCC 1075) They draw us ever deeper into Himself. One such “real symbol” is the Eucharist. It is the real presence of Jesus Christ: body and blood, soul and divinity. The whole liturgical life of the Church is oriented towards the Eucharist. It is communion with the sacred flesh and blood of Christ into our bodies, and the sanctifying grace of His soul and divinity into our souls. After they leave, Jesus reassures His skeptical Apostles, telling them, “The words that I have spoken to you are spirit and life.” (Jn. 6:63) They cannot understand this with their fleshy, materialistic minds, but rather, by trusting in God’s supernatural power. This is not a cannibalistic ritual but a heavenly sacrament. Directly before Jesus’ Bread of Life Discourse, John relates two other miracles, Jesus’ multiplication of the loaves and Jesus walking on water. Both miracles reveal that physical matter, nature itself, is subject to Jesus. Immediately before we see the bread and wine becoming His flesh and blood, John demonstrates with these miracles that material boundaries are no constraint upon Jesus. Moreover, it also transforms us as a whole community of believers, the Church, into the Mystical Body of Christ. In the Mass, after the priest invokes the Holy Spirit, an epiclesis prayer, to transform the bread and wine into the body and blood of Christ, he again, invokes the Holy Spirit, a second epiclesis, that those who eat the body and blood of Christ may be “one body, one Spirit in Christ.” He says, “Grant that we, who are nourished by His body and blood, may be filled with his Holy Spirit, and become one body, one spirit in Christ.” This is, in effect, a second transubstantiation: the transformation, by the power of the Holy Spirit, of those who eat the Eucharist into the one Mystical Body of Christ. This recalls Jesus’ prayer in Gethsemane to the Father that His followers “may be one, as We are one.” (Jn. 17:11) The Eucharist unites us mystically together in Him as living sacramental realities. As such, the Church comes together to offer “praise, sufferings, prayer, and work” in union with the sacrifice of Christ. (CCC 1368) We, by virtue of our common priesthood, can unite all that we are and do with the offering of the sacrifice of the Mass. Jesus put an end to the millennia-old, ritualistic and violent bloodletting of the pagan ancient world. Alas, He is the pure offering. “For from the rising of the sun to its setting My name is great among the nations, and in every place incense is offered to My name, and a pure offering; for My name is great among the nations, says the Lord of hosts.” (Mal.1:11). Christ in the Eucharist transforms us into His image, so that His presence enters into the world again, and in us, continues His pure offering to the Father. This entry was posted in Common Priesthood, Eucharist and tagged bread of life, breaking of bread, Communion, Emmaus, epiclesis, Eucharist, Jesus, John 6, Last Supper, Mass, mystagogy, mystery of Christ, real symbol, sacrament, transubstantiation, trogein on April 27, 2016 by Brian. The idea of living the sacramental life is to order all that we do and all that we are, by way of our intentions and invocations, to be one with Jesus Christ. We can live in union with Jesus in our most ordinary of circumstances each day. Yet, both the foundation and the pinnacle of the sacramental life are found in the sacraments themselves. As per the Catechism, “The sacraments are efficacious signs of grace, instituted by Christ and entrusted to the Church, by which divine life is dispensed to us.” (CCC 1131) They are efficacious, or produce the intended effect in our souls, in order to sanctify us. The sacraments are the source and continuation of the divine life of Jesus Christ for the world. Indeed, the whole liturgical life of the Church revolves around the seven sacraments. These are, of course: Baptism, Confirmation, Eucharist, Penance, Anointing of the Sick, Holy Orders, and Matrimony. Christ did not leave us orphaned when He left this world. 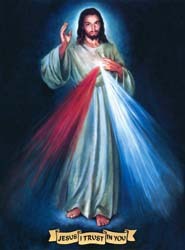 (Jn.14:18) Rather, Jesus said, “I am with you always, to the end of the age.” (Mt.28:20) When Jesus founded His Church, the Catholic Church, He intended to continue on living amongst us through the grace of His sacraments and the power of the Holy Spirit. Christ does act directly through His Church via the sacraments. Jesus’ real presence endures. He is with us always. These sacramental celebrations are, in fact, rituals instituted by Christ that are woven together with signs and symbols (CCC 1145) that “make present efficaciously the grace that they signify.” (CCC 1084) They are outward signs, a visible activity, which reveals the invisible reality. St. Augustine described them as “an outward and visible sign of an inward and invisible grace.” The washing by water in Baptism is the sign of the true reality of God’s spirit washing away our sin. However, these are not just symbols or symbolic, but rather, “real symbols,” which truly are what they represent. They are efficacious symbols that reveal a hidden reality. The water, as symbol, infused with sacramental grace does truly sanctify us in reality, albeit a hidden reality. It does what it symbolizes. In them, we proceed from the visible to the invisible and from the sign to the thing signified. Sign and reality are one. Initiation into the sacraments is to initiate us into the mystery of Christ (“mystagogy”). (CCC 1075) For the early Christians, the faith wasn’t simply going to Church on Sunday, it was an all-encompassing faith, sacrament-alizing their lives, living in communion with God and with each other. The sacraments lead us to Christ, drawing us ever deeper into His mystagogy. They draw their power from Christ Himself. For Christ Himself is the ultimate sacrament of God-made-present, just as the Church too, as the Mystical Body of Christ, is the efficacious sign, or sacrament, of Christ in the world. The Council of Trent in the 16th century reaffirmed the belief of the real presence in the Eucharist and spelled out in precise language the nature of the sacrament. The Council reaffirmed that by the consecration of the bread and wine, “there takes place a change of the whole substance of the bread into the substance of the body of Christ our Lord and of the whole substance of wine into the substance of His blood. This change the holy Catholic Church has fittingly and properly called transubstantiation.” (CCC 1376; Trent 1551) Transubstantiation is ultimately the term they arrived at to define what happens in the mystical sacrament of the Eucharist. Under the veiled appearance of bread and wine, “the whole of Christ is truly, really, and substantially contained.” (CCC 1374; Trent 1551) Jesus becomes our spiritual food. He is our “medicine of immortality.” (St.Ignatius, 110 AD) Jesus loves us so much that He desires to be consumed by us; to merge with us, and merge us into Himself. As Jesus said, “Those who eat My flesh and drink My blood abide in Me, and I in them.” (Jn. 6:56) The real presence of Jesus in the Eucharist is not an end in itself. The purpose of the real presence of Jesus in the Eucharist is for us to consume Him and be in communion with Him. Receiving Jesus in Holy Communion is meant to bring us into intimate union with Christ. It deepens our relationship with Him. Just as material food nourishes our bodies, so Holy Communion nourishes our spiritual soul. (CCC 1392) You are what you eat. Holy Communion transforms us into the image of Jesus Christ. Our personal salvation and transformation are not the only goals of Holy Communion. It also transforms us, as a whole community of faithful believers, the Church, into the Mystical Body of Christ. St.Paul wrote to the Corinthians, “Because there is one bread, we who are many are one body, for we all partake of the one bread.” (1Cor. 10:17) The Eucharist lifts us up into union with Christ, and unites us all as one in His Mystical Body. (Mysterium Fidei, 70) All who partake in the body and blood of Christ, “enter into communion with Him and form but one body in Him.” (CCC 1329) In the mass, after the priest invokes the Holy Spirit to transform the bread and wine into the body and blood of Christ, he again, invokes the Holy Spirit, a second time, that those who eat the body and blood of Christ may be “one body, one Spirit in Christ.” This is in reality the second transubstantiation; the transformation of those who eat the Eucharist into the one Mystical Body of Christ. This recalls Jesus’ prayer in Gethsemane to the Father that His followers “may be one, as We are one.” (Jn 17:11) Just as the Holy Spirit transforms the bread and wine into the body and blood of Christ, so does He transform us into the Mystical Body of Christ. The Eucharist unites us together mystically in Him. *As an aside, it’s interesting to note that various early Roman pagans had spread false rumors about Christians that they participated in cannibalistic rituals. This was probably from their false understanding of the Eucharistic meal. As recorded by Roman pagan historians, this smear was used as one of the excuses to persecute the early Christian Church. Yet, it also lends extra-biblical credence to the idea that the first Christians believed in the real presence of Jesus Christ in the Eucharist. **It’s also interesting to note that directly before Jesus’ Bread of Life Discourse in John 6, John related two other miracles. The first was Jesus’ multiplications of the loaves. This has obvious Eucharistic connotations. The next was Jesus walking on water on the Sea of Galilee. Both miracles reveal that matter, the elements and nature itself are subject to Jesus. In other words, just before Jesus discusses bread and wine becoming His flesh and blood, John demonstrates by these miracles, that material boundaries are no constraint upon Jesus. This entry was posted in Catechism of the Catholic Church (CCC), Common Priesthood, Eucharist, Mystical Body of Christ, Sacramental life, sacraments, Transubstantiation and tagged body and blood, bread of life, cannibalism, Catechism, Catechism of the Catholic Church, Communion, Emmaus, Eucharist, John 6, Last Supper, Malachi, mystagogy, Mysterium Fidei, mystery of Christ, one bread, real presence, sacraments, sacrifice, Sacrosanctum Concilium, sarx, sign and symbol, transubstantiation on September 25, 2015 by Brian.